Adventure #19: Buckhorn Wilderness – Hi, Alpine. I was going to try to come up with some suave, elegant way to announce that this was our season opener backpacking trip and it was lovely, but all that keeps coming to mind are obnoxious all-caps proclamations. I’m sorry in advance. SEASON OPENER! FIRST! OVERNIGHT! FINALLY! WATCHING THE SUN SET OVER MOUNTAINS AND LOOKING DOWN ON CLOUDS! WAKING UP TO ALPINE SMELLS! AAH! EXCITING! And it was magical. Packing was like being reunited with old friends. “Sleeping bag! I’ve missed you!” “Tent, you’re looking homey as ever!” “New stove, meet our hiking pots.” The joy of getting reacquainted with all of the overnight gear was soon tempered as our energy began to wane late Thursday night. The plan was to wake up at 4:30am and hit the road five hours north of Portland to the Tubal Cain Mine Trailhead in the NE corner of the Olympics. As packing activities rolled past midnight, the amount of work it takes to get organized and go run around in the wilderness for a few days started coming back to us, and the last little bits of packing were completed more with mean stubbornness than the fairy tale enthusiasm we’d started with. The alarm went of what felt like moments after we laid our heads down to sleep, but off we went. The drive was sunny with bright blue skies as we wound up endless miles of forest service road to get to the trailhead. Then, after a particular corner, a wisp of cloud appeared over us, tiny at first then puffing itself in size as we climbed higher: this was when I learned about my husband’s curse. Apparently, Robin has some uncanny knack to make clouds sock in trails on otherwise pristine days. He calls it a curse, I call it hilarious. 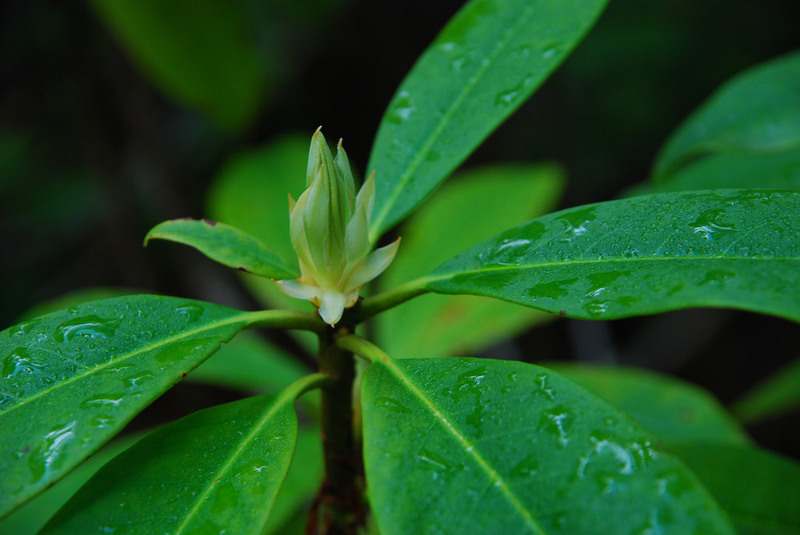 By the time we headed up the trail, the first several miles of emerald tunnels flanked by giant rhodies known as “Rhododendron Alley” were doused in a dense cloud fog which didn’t dissipate until far later in the evening. The rhodies were just starting to produce their buds, and I can only imagine that this stretch of trail when they’re in full bloom would be unimaginably beautiful. The trail emerges into a cedar forest just before crossing Copper Creek, and then the climb up begins. The grade never feels anything other than gentle due to well-placed switchbacks, making this an ideal trail for waking up your legs from a winter hiatus shlepping 35 pounds up a mountain. It was around on of the first switchbacks that I spied something in the trail, tan and still, laying lifeless on its side. I hoped so hard it was a dusty rock, but my stomach knew better. As we inched closer, it did indeed turn out to be a dead deer, very recently, and apparently from complications giving birth judging from some extraordinarily grisly details I won’t elaborate on here. Know that it was gutwrenchingly sad, and a surreal thing to clamber over her due to impassible terrain on either side of the trail. 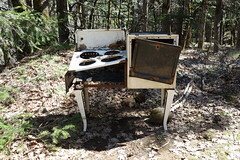 I had never encountered something like this in the wild before, and even though I knew we should probably move it off the trail, I just couldn’t. Some hikers behind us apparently had the nerve to do what we did not, as she had been removed for our hike back down. Whoever you were, thank you for taking one for the team. 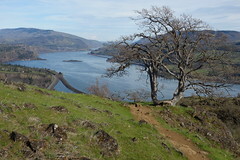 After a few dusty switchbacks up the hillside, the trail resumes its southward ramble. The trail stays about 2/3 of the way up the ridge above treeline and affords views up and down the valley leading to Buckhorn Mountain. Granted, due to Robin’s curse, we couldn’t see much of the view since it was hiding behind cloud cover, but the hike out proved this section to be one long jawdropping view of snowy mountains. At the Buckhorn Lake trail junction, we opted to keep climbing up for more views to try to find a spot for the tent on top of the ridge. I have a hard time picking mosquito-y forest settings when I’ve been climbing up all day with a pack on — I want alpine vistas, dammit! So a vista we found. After two botched potential sites–one was 4′ from a giant swarming anthill, the next was too small for our tent–we found the perfect spot on a flat rock covered in hoof prints. Even better, it was up a deer/sheep path that cut straight up the yellow avalanche lily-studded slope. We sat in the cloud, cooked dinner, then yelped with joy when a patch of bronze lit up the horizon. In a matter of minutes, the opaque clouds melted away and unbelievably long ranges of snowy mountains started peeking through. By sunset, the sky was completely clear and I just about gave myself a jaw cramp from gaping at the view. The mountains were like shark teeth, row after row after row as far as we could see. 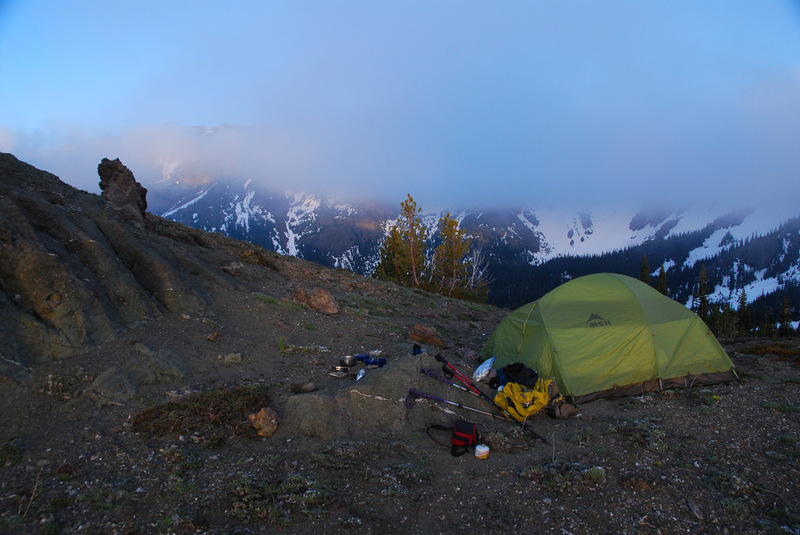 Having primarily kept our backpacking to the Oregon Cascades featuring one peak at a time, the sheer volume of mountains around our one tiny camp was overwhelming. After a cold night with temperatures in the 20s (our water froze! 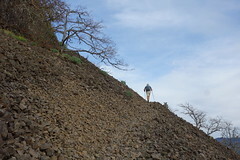 ), we were eager to get the blood flowing and headed out for our dayhike up Buckhorn’s flank. 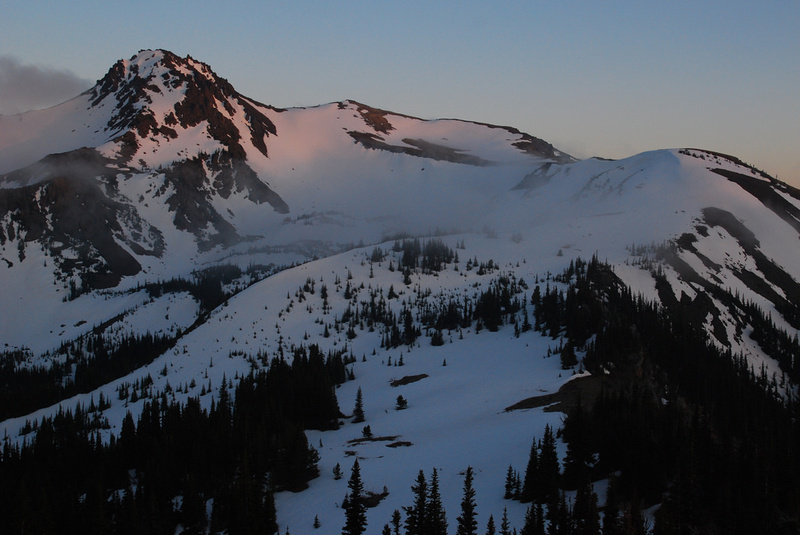 After one steep, snowy slog, the remaining ridge was melted clear and covered in tufts of wildflowers. Buttercups, phlox, and something magenta abounded. It was sunny, warm, and perfectly clear on our side of the Buckhorn ridge, but we watched as a menacing dark gray mass tried to push over from the other side. The view was surreal from the top, with our valley a pristine summerland, and the other side over by Marmot Pass completely socked in. The west side’s clouds never succeeded in winning the tug-of-war game and stayed on their side of the pass, granting us another perfect sunset, which we watched from a perch above our campsite, trading the camera and a flask of Riverboat Rye back and forth while we enjoyed the show. Robin’s Trip Report can be found over at Portland Hikers.